Today we are sharing Victoria's apple pie recipe, the one she learned from her mother (and from American culinary icons Julia Child and James Beard). We've included Julia Child’s pie crust recipe if you’re up for a challenge, but a store-bought crust will be just as delicious. The secret here is in simplicity, and in using crispy tart apples. Tart apples provide texture and balance sweetness. This pie is perfect for breakfast, lunch or dinner! 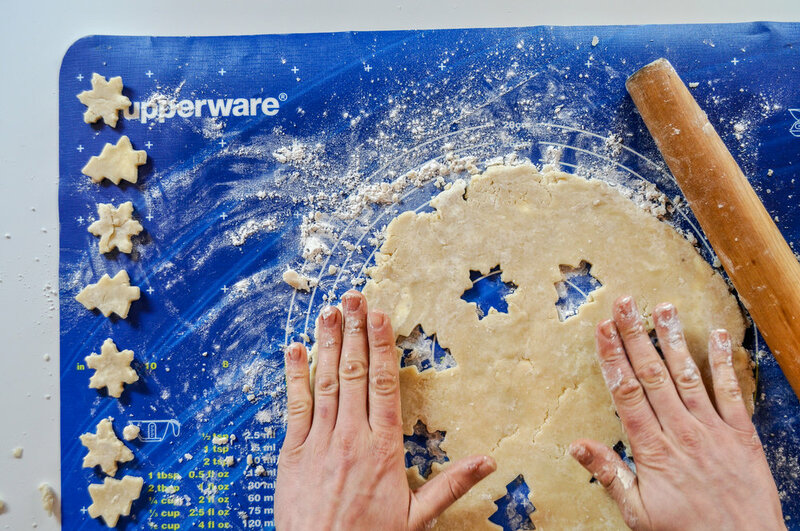 Use small holiday cookie cutter for the top crust of the pie for a festive touch! Don’t forget to add the butter! Before you start make sure that your butter and crisco are very, very cold. Cut the butter into ½” cubes and return to the refrigerator. Cut the crisco into chunks of similar size and return to the refrigerator. Measure the flour and salt into a large bowl. Toss the butter cubes in the flour. With a pastry cutter, fork, or your fingers work the butter into the flour as quickly as possible (so it stays cold). 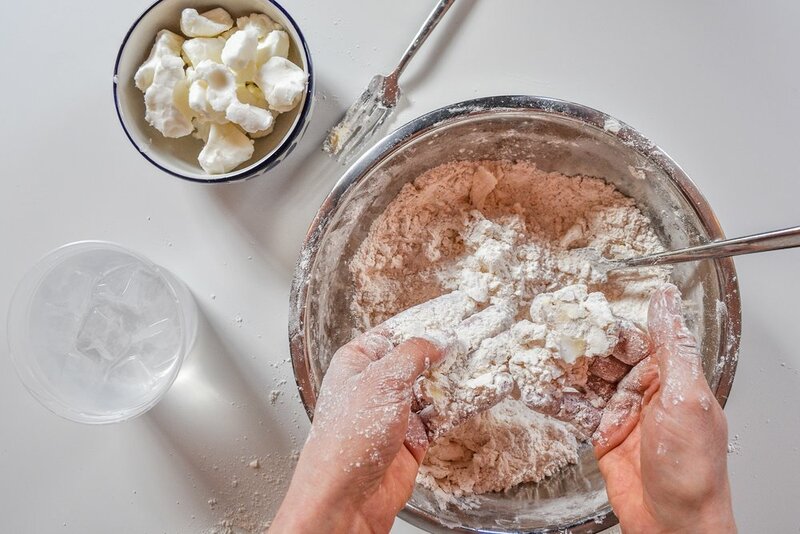 Once the mixture resembles coarse crumbs toss the crisco chunks in with the flour as well and cut and work them into the flour until there are no chunks remaining larger than a pea. A bit at a time, add the ice water and toss into the flour-butter mixture with a fork. Once all of the water is incorporated the little clumps should stick together when squeezed. Add more water, a tablespoon at a time, only if needed to make the dough come together. 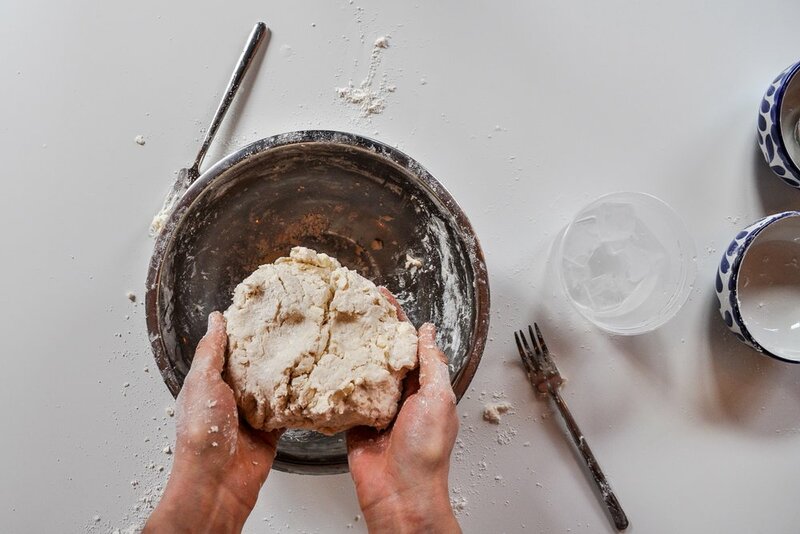 Gather the dough into a ball, divide in two and then press each ball into a disc. Wrap in plastic and refrigerate for 1 hour. PEEL AND CORE THE APPLES, AND THEN SLICE THINLY, ABOUT ⅛” TO ¼”. 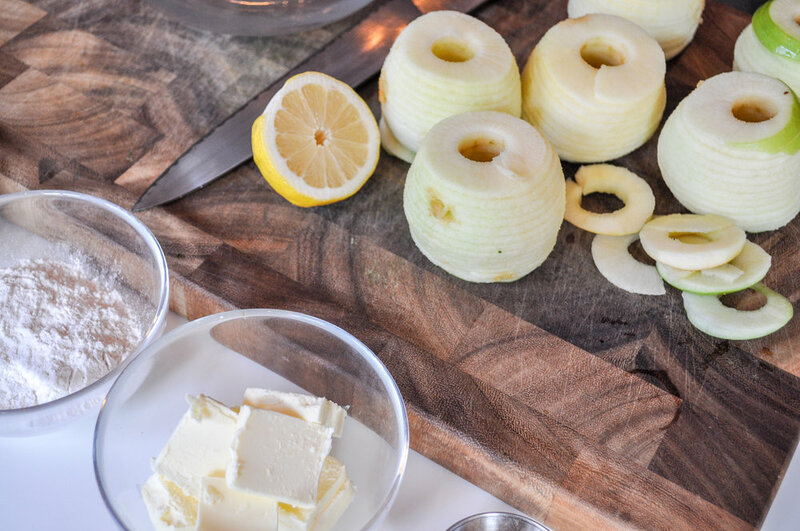 TOSS THE SLICED APPLES IN LEMON JUICE AND SET ASIDE. IN A SMALL BOWL WHISK THE SUGAR, CINNAMON AND FLOUR TOGETHER. 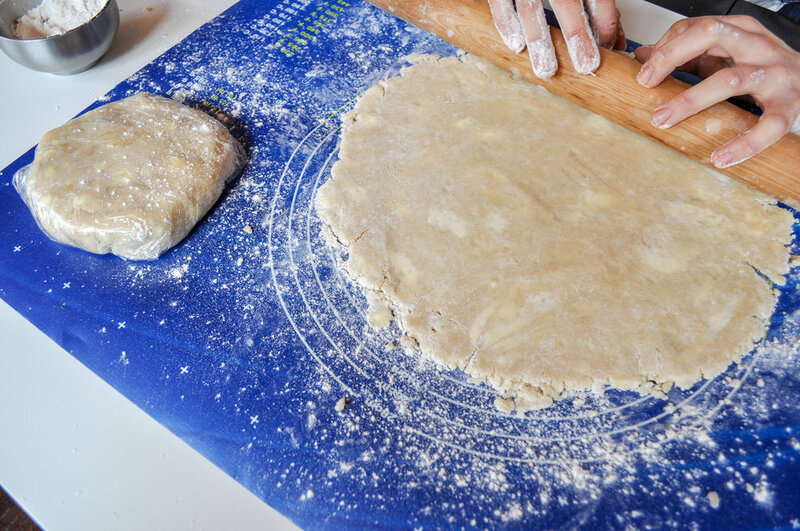 ROLL OUT ONE CIRCLE OF DOUGH UNTIL IT IS 1” LARGER THAN THE TOP EDGE OF THE PIE TIN WHEN IT IS INVERTED ON THE DOUGH CIRCLE. LAY THE DOUGH GENTLY IN THE PIE TIN AND LET IT SETTLE DOWN INTO THE BOTTOM. THERE SHOULD BE SOME OVERHANG. ADJUST AS NECESSARY TO CENTER THE DOUGH IN THE TIN. ROLL OUT THE SECOND CIRCLE OF DOUGH UNTIL IT WILL FIT OVER THE TOP OF THE PIE WITH A SLIGHT OVERHANG, IT SHOULD BE SMALLER THAN THE FIRST. SET THE TOP CRUST ASIDE AND CUT SOME DECORATIVE VENTS - BE CREATIVE! TOSS THE APPLES WITH THE CINNAMON-SUGAR MIXTURE AND TIP THEM INTO THE DOUGH LINED PIE TIN. CUT THE 2 TABLESPOONS OF BUTTER INTO SMALL PATS AND DOT THEM OVER THE TOP OF THE APPLES. 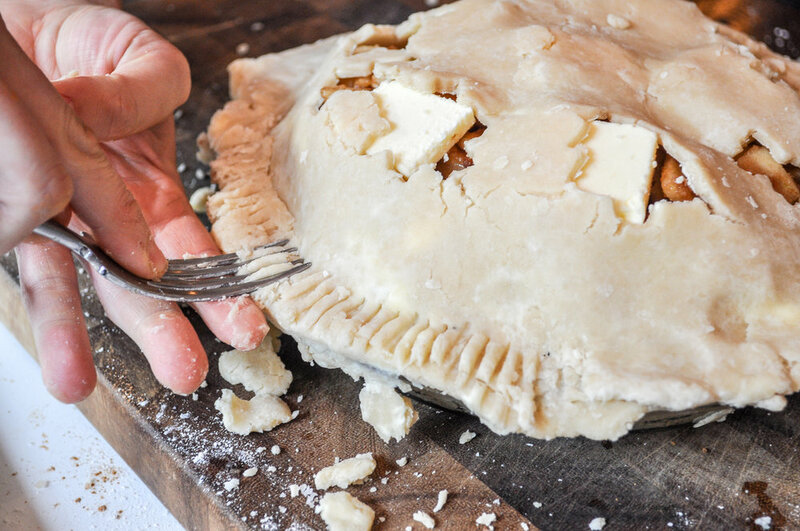 PLACE THE SECOND CRUST OVER THE APPLES, AND USE THE TINES OF A FORK TO PRESS THE CRUSTS TOGETHER AROUND THE EDGE. RUN A KNIFE AROUND THE OUTER EDGE OF THE TIN TO REMOVE THE EXCESS CRUST. PLACE THE PIE ON A BAKING TIN (THIS WILL SAVE YOU FROM A MOLTEN SUGAR JUICE MESS IN THE BOTTOM OF YOUR OVEN), AND PLACE IN THE CENTER OF THE OVEN. BAKE FOR 15 MINUTES, THEN REDUCE THE OVEN TEMPERATURE TO 350 DEGREES AND CONTINUE TO BAKE FOR ANOTHER 45 MINUTES TO 1 HOUR, UNTIL THE FILLING IS BUBBLING AND THE CRUST IS GOLDEN BROWN. REMOVE FROM THE OVEN AND LET COOL (OR NOT!). add a dollop of homemade whipped cream or a scoop of ice cream to each slice before serving!